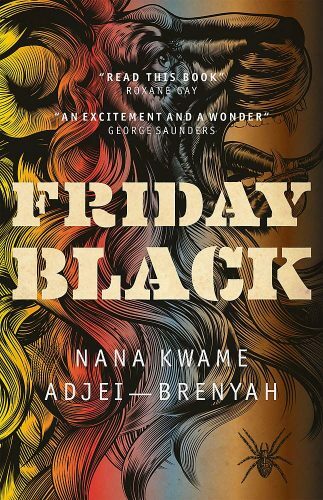 Nana Kwame Adjei-Brenyah’s debut, Friday Black: Stories, is a collection of speculative fiction stories built on the hopes, fears, and daily experiences of mostly urban, mostly POC populations. Almost every story in the book would remain strong, topical, and engaging even with the speculative elements removed, but their science fiction and horror trappings allow the author to shine a bolder, brighter light on how our current culture is both stratified and oversimplified. Much of modern life revolves around someone providing goods or a service to someone else, and yet a good portion of speculative fiction ignores the work-a-day basics of a society in favor of its high-stakes, headline-grabbing professions. While there are a few of the latter type of story here, Adjei-Brenyah largely keeps his focus on working-class folk in general, and on the retail world in particular. He twists the clichés that “the customer is always right,” and that retail work is supposed to be only a stopgap on the way to better paying work, instead showing us realities in which the customer is clearly wrong and retail work is in fact the only way to come even close to getting ahead. The title story, for example, is almost fable-like, elevating the Black Friday madness we see on the news every year into an actual disease that alters language and physicality to extremes—while only slightly exaggerating the violence done yearly in the name of getting the best holiday deals. Our narrator is a survivor, and top salesman, of previous Black Fridays; he “speaks” the guttural rasps of increasingly mindless customers and at least implies that he’s a carrier of the disease without being a direct victim of it. The store and the mall that contains it are bloody carnal grounds by the end, but most of the staff seem unaffected, just piling bodies out of the way and restocking shelves before the next rush. Is the story a tired employee’s exaggeration of events, or is it a dystopian future in which rampant consumerism has moved from an occasional problem to a pandemic? It could be either, and I think the author leaves it up to the reader to decide. Except that the same character narrates “How to Sell A Jacket as Told by Ice King,” another hard look at retail sales-store culture. Taken together, the stories show us a character full of bravado and a perhaps earned, perhaps inflated, sense of self and ability. In “How to Sell a Jacket,” there’s no incensed horde of raving customers, no physical body count, but a perhaps more serious threat to Ice King’s sales: a savvy new coworker. Is Ice King really as good as he makes himself out to be? Or are the events of Friday Black all in his head, a way to make himself the hero of his own story when real life (in the form of a more talented colleague) beats him down? There is a subtle counterpoint to Ice King’s focus and style in “In Retail,” a story that sees the return, in a more oblique way, of the mall’s body count: as a different store employee tries to understand why so many retail workers commit suicide in the mall’s atrium, their small kindnesses towards a customer with a language barrier balance out the grinding descriptions of living from meager paycheck to meager paycheck. Indeed, I’m again not sure the author wants to provide the reader with an easy answer to any of the questions he poses. That’s true, too, in “Zimmer Land,” a blend of horror and near-future SF that features a different kind of retail work, wherein the whole point is that the customer is always right, regardless of outcome. The setting is a fully immersive, escape room-style experience in which customers (read: white men) can work out the aggression they feel due to no longer feeling “in control” by “defending their home” from intruders (read: people of colour). The narrator is the local man hired to play the intruder in various escalating scenarios. If that’s all the story was about, if it took place only in the imagined scenarios of the amusement park, it would be shocking and horrific enough. But Adjei-Brenyah also shows us behind-the-scenes machinations that conspire to keep the narrator in his place—though for how much longer is less clear. The story asks us to consider the impact of white-owned businesses and gentrification in POC communities, where the input of POC is sought only to be ignored; whether “moving up” equates to “selling out”; and how far marginalized people are expected to go to placate the non-marginalized. A novel or novella-length version of this story would be an amazing thing to read. “The Finkelstein 5,” the collection’s brutal lead-off story, takes many of those same questions and sets them firmly in a present-day we cannot help but acknowledge as our own. This story is as close to “ripped from the headlines” as the author gets in this collection: the acquittal of a white man, who felt “threatened” enough by a group of black children (one a preteen) to murder them, causes a community to go beyond protests (peaceful or violent). The names of the murdered children become a mantra for the small mobs that seek retribution after the court system spectacularly fails. The story is told mostly through the eyes of a young man who has learned how to “dial up or down” his blackness given the situation, and we see how becoming a part of the crowd affects his ability to “just fit in.” There are asides to transcripts from the court, showing us the murderer’s testimony, but we never see the inciting event through the eyes of the victims or on-scene witnesses. We’re left to think not only on the public’s reaction to the verdict (senseless violence begetting further senseless violence, revenge spinning in on itself), but also on how the media’s presentation of the original murders differs from their coverage of the subsequent fatal attacks. Even more than “Zimmer Land,” this story feels like it could happen tomorrow, and is probably worthy of several long, analytical essays. Equally as topical, if more personal in execution, are “Lark Street” and “Light Spitter.” The latter story takes on school shooters: both their motivation and the question of whether they experience any remorse. But the shooting is just the beginning of this story, as the shooter and his sole victim must navigate a shared after-life mission. Will they end the cycle of bullied-victim-becomes-murderer or perpetuate it? In “Lark Street,” meanwhile, a man is haunted by the talking fraternal twin fetuses his girlfriend has recently aborted. His confidence in the decision he has in part helped make wars with the reality of how he thinks he would have raised them and how they’d have turned out. Like “Friday Black,” this is another story in which the horror element might be really happening to the main character or might all be in his head. Family is at the core of so many of these stories (the main character of “The Finkelstein 5” tries his best to be a good son; the “Lark Street” protagonist wishes he could believe he’d be a fair father, two of the protagonists of “Light Spitter” have worried and helpless mothers), but especially so in the flash fiction piece, “Things My Mother Said,” and “The Hospital Where.” These stories focus respectively on how far a parent will go to protect and nurture their child, and on an adult son who must protect and nurture his elderly father. Both have elements of magic woven in, although this is much more obvious in the latter than the former. “The Lion and the Spider,” on the other hand, splits the difference between the two, centering on a near-adult son who copes with an absentee father by remembering stories told to him when he was child—and conjuring new stories of his own. Other stories foreground their high concepts more confidently. “The Era,” for instance, tackles genetic and social engineering in another near-future setting, in which everyone speaks the truth in an attempt to air the resentments that otherwise lead to violent outbursts. But all that genetic engineering has created families wherein how well one gets treated depends on whether the enhancements have left one too smart or congenitally dumb. What happens to those stuck in the middle? And what happens to those who want to return to a time when it was okay to lie or remain silent just to protect a loved one’s feelings? The collection’s closing piece revisits several of these and other of the stories’ themes. “Through the Flash” presents a post-apocalyptic Groundhog Day: the protagonist and her neighbors repeatedly relive the day leading up to a nuclear blast, but to an extent are able to change what they do, as they become fully aware of the cycle of repetition. Again Adjei-Brenyah asks how far we will go to protect family, whether violence always begets violence, and whether we can change our own nature to survive as a society—but adds another, deeper question: does being locked into an unchangeable outcome free us or trap us? This is a fitting note on which to end the collection: Friday Black forces the reader to face the modern world’s inequalities and expectations and doesn’t provide any easy answers to the questions it raises. It’s well worth the time spent to read, reread, and ruminate upon it.